Casa Bella’s Spanish architecture and gardens make it stand out. I loved lounging by the pool as breezes blew through the palm leaves above me. The al fresco dining area was perfect for nights when we couldn’t bring ourselves to leave the villa, and Holetown was just a few minutes away when we wanted an easy meal. Take a dip in the private pool or jump into the car and head to Sandy Lane or Paynes Bay beach, where you’ll find amazing sand and calm waters for a true island experience! 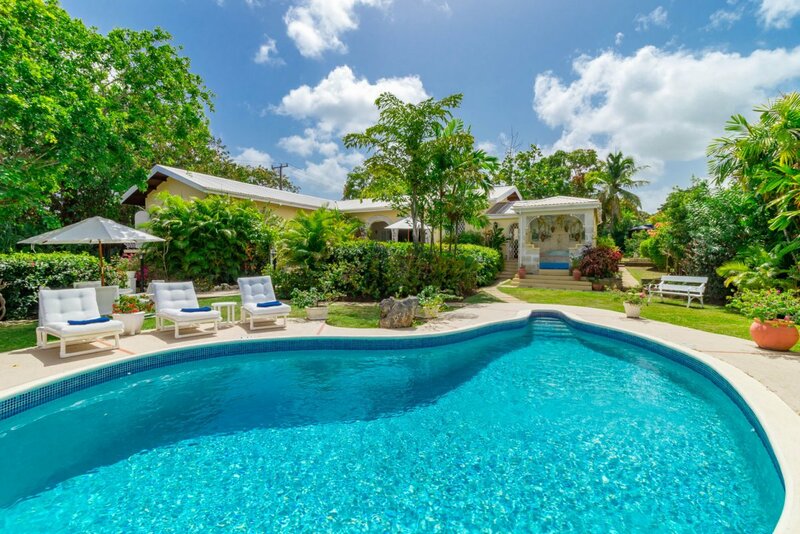 Casa Bella resides over Barbados’ West Coast on Sunset Ridge, and benefits from ocean views and well-kept gardens. The villa’s freeform pool is in the middle of the garden terrace, surrounded by mature gardens. Loungers provide space to tan and recline, and a gazebo holds the hot tub. The garden features several sitting areas, and the portico shades an al fresco dining and living area. Draw the shades for an afternoon snack, and pull them back up to enjoy the view through the Spanish archways. Inside, a spacious living area features plush, floral sofas and cable TV. The kitchen is well-equipped with appliances and cookware, and connects to the formal dining room. The decor is colorful and tropical without being overwhelming. The sleeping quarters make the villa ideal for a family with young children, and each of the four bedrooms are fully air-conditioned. The master suite has exterior access to the terrace through unique archways on either side of the king-sized bed, and an ensuite bath with a shower. The second bedroom also has exterior access and an ensuite bath, but has two twin beds that can be converted into a king. The final two bedrooms share a bathroom; one has a queen-sized bed and the other has two twin beds. These bedrooms would be perfect for pairing older siblings with young children, or to create separation between two families sharing the villa. Casa Bella is a five minute drive from Holetown, where visitors can explore the island’s dining, nightlife, shopping, and excursions. Sandy Lane Beach is also a few minutes away, and is known for its calm waters and lots of activities. Transfers can be arranged, at an additional charge. Costs vary depending on # of persons and also type of vehicle required.